CATS now 17-15 on season and 2-10 in SEC play. 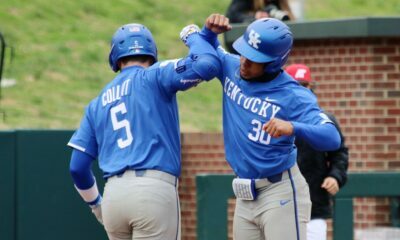 The Kentucky Wildcats headed west for a SEC weekend series in Columbia to face the Missouri Tigers. Kentucky came into the weekend series with a 16-13 overall record and 1-8 in SEC play. Missouri started the series with an overall record of 20-10-1 and 3-5-1 in SEC play. Missouri is currently ranked third in the SEC East and Kentucky is ranked seventh. The Wildcats are looking to get on track this weekend. In the first game, Jimmy Ramsey got the start for the Wildcats. Cantelberry got the start for the Tigers and was 2-2 on the season. Missouri got on the board first in the bottom of the first inning as Zimmermann singled to left field, scoring Misner. Mcdaniel singled to left field, scoring Zimmerman. Kentucky got on the board in the top of the fourth inning with TJ Collett hitting a double to right field, scoring Ryan Shinn to make the score to 2-1. Kentucky added two more runs in the top of the sixth inning with Breydon Daniel hitting a double to left field, scoring TJ Collett and Ryan Shinn with both runs being unearned. The Cats added another run in the top of the eighth inning with Jaren Shelby hitting a solo run to put the Cats up 5-4, which ended up being the final score. Cole Daniels got the win to improve to 3-0 on the season and Carson Coleman got the save to give him his second save of the season. Jacob Cantleberry got the loss for the Tigers to put him to 3-2 on the season. Kentucky was led at the plate by Ryan Shinn going 3-3, A. Shultz going 2-5, Breydon Daniel going 1-4, TJ Collett going 1-4, Jaren Shelby going 1-4 and C. Kessler going 1-4. This win puts Kentucky to 17-13 overall and 2-8 in SEC play. 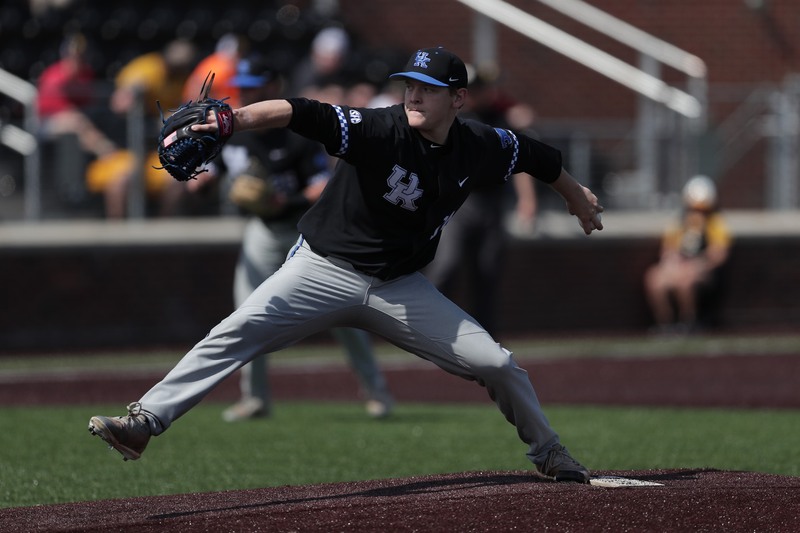 Kentucky threw four different pitchers in game one, consisting of Jimmy Ramsey, Cole Daniels, Daniel Harper, and Carson Coleman. 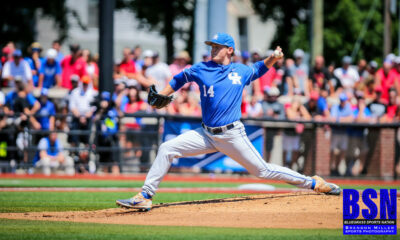 In game two, Zach Thompson got the start for Kentucky who is projected first round in this year MLB draft. LaPlante got the start for Missouri. Missouri got on the board first in the bottom of the fourth inning with Zimmerman doubling to left field, scoring Misner. Missouri scored two more runs in the bottom of the sixth with Zimmerman laying down a sacrifice bunt back to the pitcher, scoring Holt. McDaniel singled to left field, scoring Cornelius. The Cats battled back in the top of the seventh with C. Kessler hitting a solo home run putting the score to 3-1. Jaren Shelby hit a three-run homerun in the top of the eighth inning to tie the game up at 4-4. In the bottom of the ninth Missouri hit a walk off single to left field, scoring Brumfield to win the game 5-4. Cameron Dulle got the win for Missouri to put him at 3-3 on the season. Cole Ayers got the loss for Kentucky, he is now 0-1 on the season. This loss dropped Kentucky to 17-14 overall and 2-9 in SEC play. Kentucky was led at the plate by C. Kessler going 2-3 with a homerun, Ryan Shinn 2-5, and Jaren Shelby going 1-2 with a homerun. 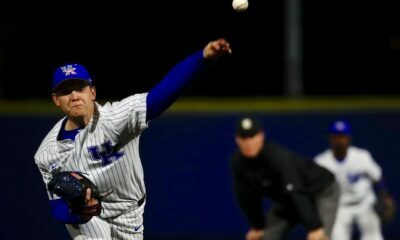 Kentucky’s ace, Zach Thompson threw six complete innings allowing three runs, giving up five hits, striking out six, and threw 58 strikes out of 87 pitches. In the final game of the series, Grant Macciocchi got the start for Kentucky and Siikkema got the start for Missouri. For the first time this weekend, Kentucky got on the board first in the first inning with A. Shultz hitting a solo homerun to put Kentucky up 1-0. Missouri scored two runs in the bottom of the third inning on an error by Kentucky’s third baseman, Kessler allowing Missouri to score two runs. Kentucky scored a run in the top of the fourth inning with Ryan Shinn hitting a solo homerun to left field to tie the game up at 2-2. Missouri added two runs in the bottom of the fifth inning with Zimmerman hitting a single to left field, scoring Broyles and Gomez, both unearned to put the Tigers up 4-2. In the bottom of the seventh inning, Missouri hit two home runs to extend the lead to 6-2 and then scored three more runs that were unearned to put the Tigers up 9-2 after seven innings. TJ Sikkema got the win for the Tigers putting him to 3-2 on the season and Braxton Cottongame got the loss to put him at 0-1 on the season. Cottongame gave up zero earned runs in the 1.1 innings he pitched. Kentucky pitched seven different pitchers in the third game. This loss puts Kentucky to 17-15 overall on the season and 2-10 in SEC play. Kentucky was led at the plate by Ryan Shinn going 2-4, E. Curtis going 2-4, and A.Schultz going 1-3. Kentucky gets back in action Wednesday at 7 PM at Lipscomb University and then on the road again this weekend for a three-game weekend series against the University of Mississippi. Weekend Recap: Kentucky went 1-2 on the road against SEC opponent Missouri this weekend. Kentucky won the first game with a final score of 4-2, lost the second game 5-4, and lost the third game 9-2. Kentucky falls to 2-10 in SEC play, which is last place in the SEC East. 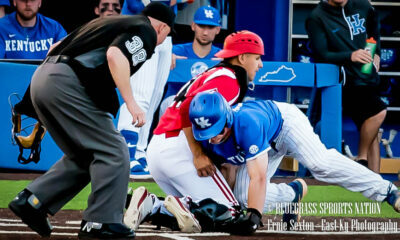 Kentucky scored 10 runs, had 24 hits, committed six errors, and left 20 runners on base this weekend.